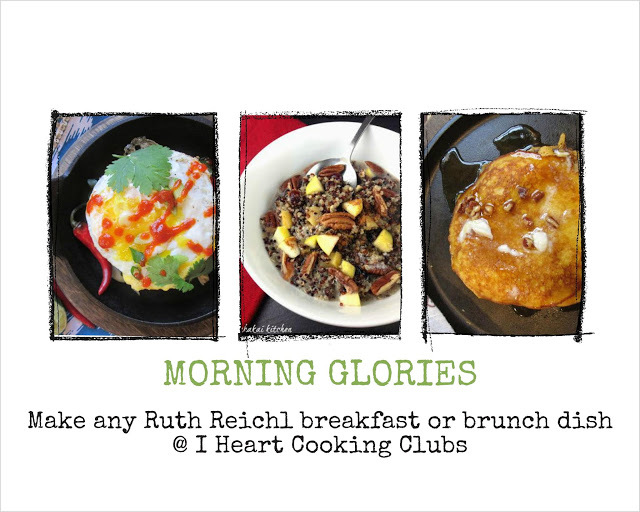 This week’s theme for I Heart Cooking Clubs is Morning Glories. During the weekends, it’s all about breakfast. 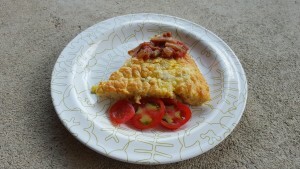 Typically we have a large breakfast and then dinner, skipping lunch, but it doesn’t seem like I spend enough time blogging about that morning meal at EE. Most of my morning glory posts deal with quick breads and granola. 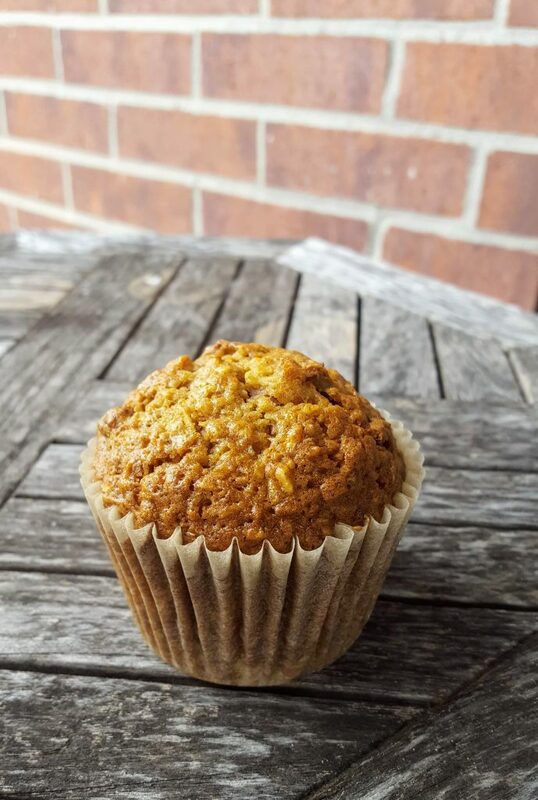 When I had time to finally sit and think about the theme and what I would cook, I remembered that long ago I made and posted “Morning Glory Muffins.” (I almost didn’t link back to the post because of true embarrassment of my early blogging “style.”) This recipe was absolutely worthy of a re-post! Put a rack in middle of oven and preheat oven to 350 F. Generously butter 30 muffin cups. Whisk together flour, sugar, baking soda, cinnamon, and salt in a large bowl. Stir in carrots, raisins, pecans, coconut, and apples. Whisk together eggs, oil and vanilla in another bowl, then add to flour mixture and stir until just combined. Spoon batter into muffin cups, filling them to the top. Bake muffins, in batches if necessary, until springy to the touch, about 30 minutes per batch. Cool in pans for 5 minutes, then turn out onto a rack and cool to warm or room temperature. Cook’s note: These muffins keep, stored in an airtight container at room temperature, for up to 2 days. These actually freeze really well, too, which is a good thing for this giant recipe. I actually made a half-batch this time around which still made a dozen pretty large muffins. There is definitely more veggie and fruity goodness in this recipe than dry ingredients. The batter may look quite dry. Don’t be alarmed. They rise up beautifully. We rounded out our Morning Glory Sunday with some homegrown citrus that the in-laws brought to us last weekend from their backyard in south Texas. On a very lazy Saturday, I started reviewing past posts and found that I had actually utilized Reichl’s recipes for a few other Morning Glories. and Eggs and Mushrooms in Ham Crisp Cups. Stay tuned for next weeks IHCC post. I hope to get it in before the deadline! Have a great week, all! 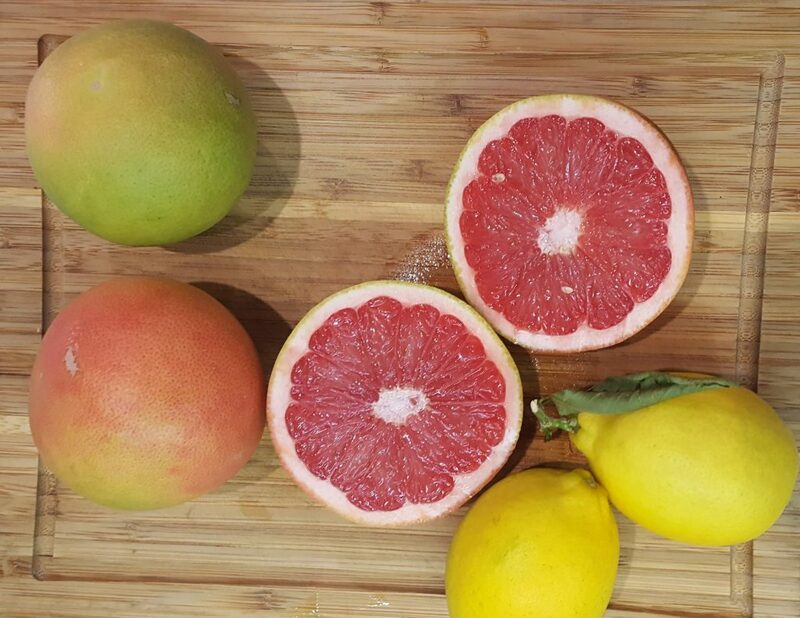 homegrown citrus? so jealous. 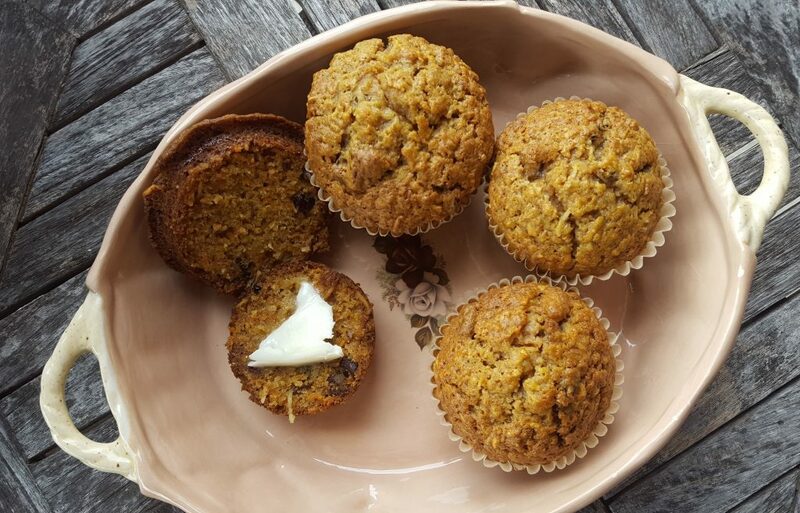 Wow, you have lots of wonderful things packed into these muffins. They taste great for sure! Yep, and even better the second day! 12 carrots? How big? These muffins look wonderfully delicious and tempting! I just grate them until I get four cups. This makes a huge batch! I love muffins and morning glories sound delicious. I will look into this one. I need that egg and mushroom ham crisp. Mouthwatering! Thanks for your nice comment at my place. To answer your instant pot question, we got the 6 quart size. I haven’t used it yet, still scared of the steam release! My husband loves it and has made three dinners so far, all have been delicious. I’m going to write more about that this week when I have a computer, it’s harder to post using a tablet. Your Ruth Reacher recipes are great! I may have to break down and buy one before the holidays. Can’t wait for you to write more about it! Dried cranberries and apples in the morning glory remind me of this Thanksgiving sauce, I guess you would say, that is very sweet and delicious when put together with my Thanksgiving meal. These would be great for Thanksgiving morning. I would like to turn these muffins into a bread. I think there is too many carrots in them for that, though. Well, I can imagine they were so good with those home-grown grapefruit. 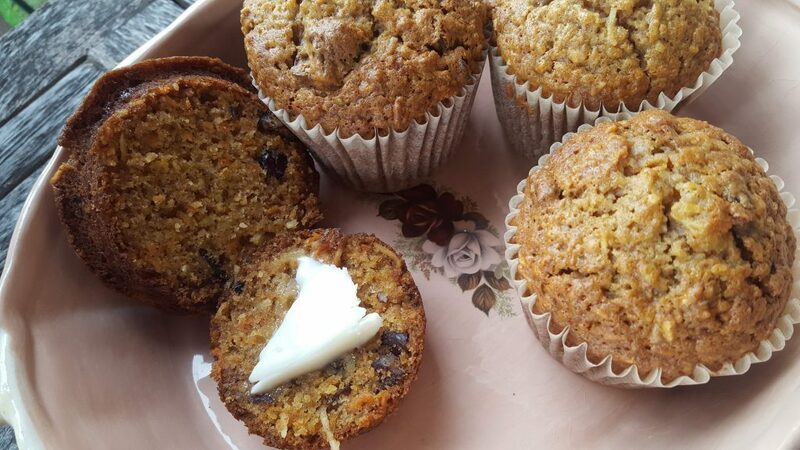 I’ve made these muffins and the cakes too, so many times years ago and need to do it again. Still wish “Gourmet” mag was still published! Me, too, Pam. Even with all the over-the-top advertising. My impression is that Reichl is a really down-to-earth sort so I wonder how she dealt with all that. These look so delicious, and have a beautiful texture, and let’s face it….with all the fruit and veg they’re healthy, right? 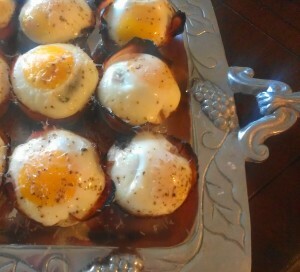 I really want to try the eggs and mushrooms in ham crisp cups and every other breakfast recipe. Oh my, how I love breakfast foods! Of course, they’re healthy! I need to revisit the egg mushroom ham dish as well. It’s been too long.